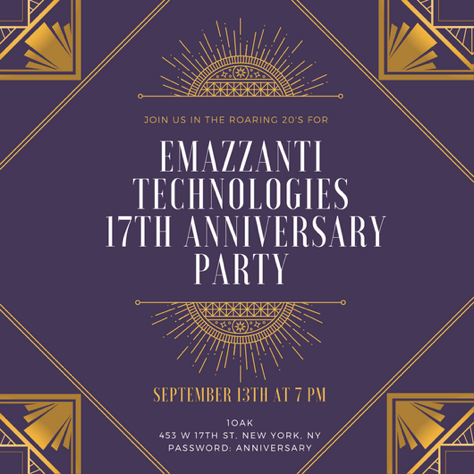 Hoboken, NJ ­- (Cision) September 6, 2018 – Hoboken, New Jersey-based eMazzanti Technologies announced its 17-year anniversary, reached the previous month. To celebrate the milestone, the company planned a 17th Anniversary Party for customers, employees and vendors. The anniversary celebration took place at the stylish 1OAK club, 453 W 17th St., New York, NY, on Thursday September 13, 2018, at 7:00 PM. The company invited participants to “Join us in the Roaring 20’s for a Jazzy Evening of Festivities” and an opportunity to reminisce 17 years of mutual growth. Since its founding in 2001, the NYC area IT consultant and Managed Services Provider (MSP), has enjoyed consistent double-digit growth, a string of accolades and successful, long-term customer relationships for 17 years. The technology company also appeared on every Inc. 5000 list from 2010 to 2017.
eMazzanti Technologies was founded in August 2001, just weeks before 9/11. The company built its success on helping other businesses survive and thrive through disasters such as 9/11, Hurricane Sandy and economic downturns. It partners closely with customers to continue growth through hard times and emerge stronger than the competition with the return of prosperity. A three-time Microsoft Partner of the Year award winner, eMazzanti Technologies also boasts numerous accolades. The company has been named NJBIZ Business of the year, one of the world’s top MSPs and a Top 200 U.S. Microsoft Partner. Growing along with the Hoboken technology company, eMazzanti’s customers sometimes outshine them. For example, before maturing into household names and international retail powerhouses, two growing retail chains relied on IT services from eMazzanti to support expanding operations. Building on those successes, eMazzanti has developed a focus on retail technology, as well as manufacturing and distribution IT and other industries. Furthermore, the acquisition in 2016 of Liqui-site, an award-winning digital marketing agency provided a logical extension of IT services to the entire eMazzanti customer base. In addition, the company announced in August the establishment of a branch office in Montreal. The strategic move expands eMazzanti’s services in Canada and adds French language support to several other languages spoken by the eMazzanti support team. eMazzanti actively supports ocean wildlife conservation efforts with the company’s Blue Project. Through the Blue Project, the company is building bridges and awareness. Notably, the company recruits researchers as partners. Then, it works on better ways to share the research that is being done in the name of the environment. Looking ahead, the Mazzantis say that they expect continued growth in cloud services and retail IT. Likewise, the co-founders see increased demand for information governance, security and digital marketing solutions. Having sustained revenue growth and productivity increases for 17 years, company leaders seek the same for customers and partners. Henceforward, through the current strong economy and for many years to come, mutual success remains their goal. eMazzanti has made the Inc. 5000 list eight consecutive years, is a 2015, 2013 and 2012 Microsoft Partner of the Year, 2016 NJ Business of the Year, 5X WatchGuard Partner of the Year and one of the TOP 200 U.S. Microsoft Partners! Contact: 1-866-362-9926, info@emazzanti.net or http://www.emazzanti.net Twitter: @emazzanti Facebook: Facebook.com/emazzantitechnologies.